Baggy MTB shorts are less comfortable, hard wearing and above all…stylish. When you’re heading off the beaten track you’ll want a pair of loose fit, flexible and durable shorts to ride in comfort. We’ve put together a list of the best MTB shorts you can get at different prices for every budget. As with all clothing the more you spend the better the fit will be. Premium baggies use more technical fabrics will be and come with more features. The best MTB shorts include stretch panel designs that give you a greater range of motion while riding. Most shorts have Nylon fabric for its hard-wearing properties. Ripstop, Ballistic Nylon, double and triple stitching will all enhance durability. Unlike lycra shorts which have a padded insert (called a chamois) for comfort in the saddle, MTB baggy shorts don’t usually come with one. However, good MTB shorts will have a padded liner you can slip underneath the shorts. If you’re planning on riding in soggy weather, then baggies with a waterproof coating can greatly reduce discomfort. Breathable fabrics or mesh panels will help you keep your cool on the ascents. For epic trail sessions, these MTB shorts will make your ride more enjoyable. The Tenn Burn MTB baggy shorts are ideal for taking on epic descents without breaking the bank. These affordable shorts blend durable Nylon and Neoprene for a manoeuvrable and hard-wearing trail short. A casual cut offers room for a padded liner underneath. 2 zipped pockets give you room to stash ride essentials. A solid all-day, all-mountain pair of shorts. Versatile and affordable MTB specific shorts. 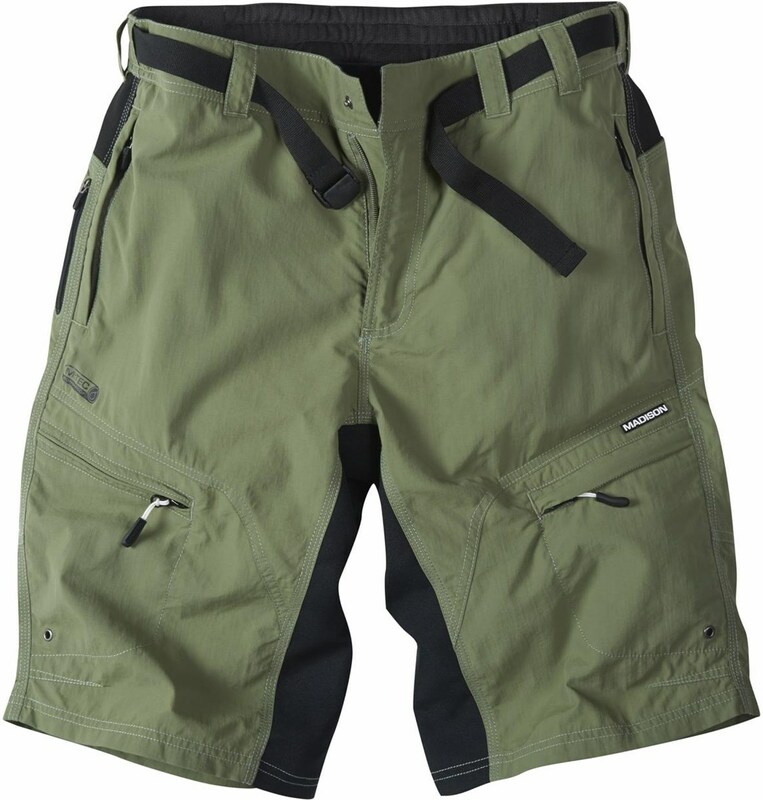 The Madison Trail baggy shorts are robust and heavy on features for this price point. These durable shorts are constructed from Ripstop fabric for multi-season use. Ripstop is a fabric with grid style stitching to prevent tears from snags as you ride. A four-way stretch lumbar panel gives you total freedom of movement when you’re getting energetic on the descents. Madison’s Trail shorts look just as good on the bike as off it. 5 zippered pockets give you all the storage space you’ll need to stash essentials. Included with the shorts is a removable liner with a good quality 2D Coolmax chamois pad, letting you ride all day long. Double and triple needle stitching let these shorts take some abuse. You can also buy these in a 3/4 version for more protection against the elements. 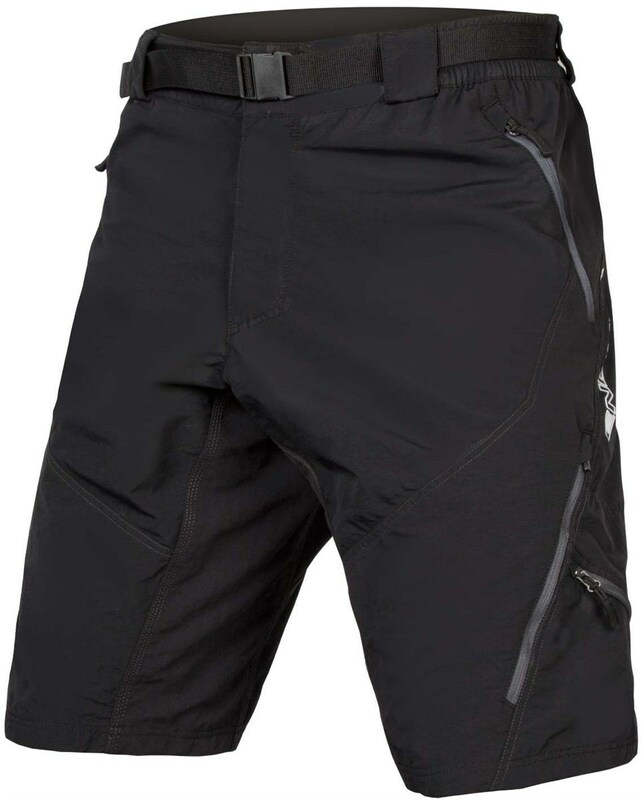 The Endura Hummvee shorts are one of the most established, well-loved models in the MTB world. They’re packed full of trail-ready features, they’re comfortable and hard wearing on short and long rides. This is the Humvee II version which builds on the original legend. You’re getting a durable Nylon fabric with mini-ripstop for durability. A DWR finish helps shed water for use on wet trail rides. A seamless seat panel ensures max comfort for your sensitive areas. Meshed thigh vents keep you cool while keeping out the debris. Included is a ClickFast detachable liner with a 200 series pad for added comfort when you’re cranking out the miles. No less than 6 pockets ensure you’ve got plenty of room to stash your ride essentials. 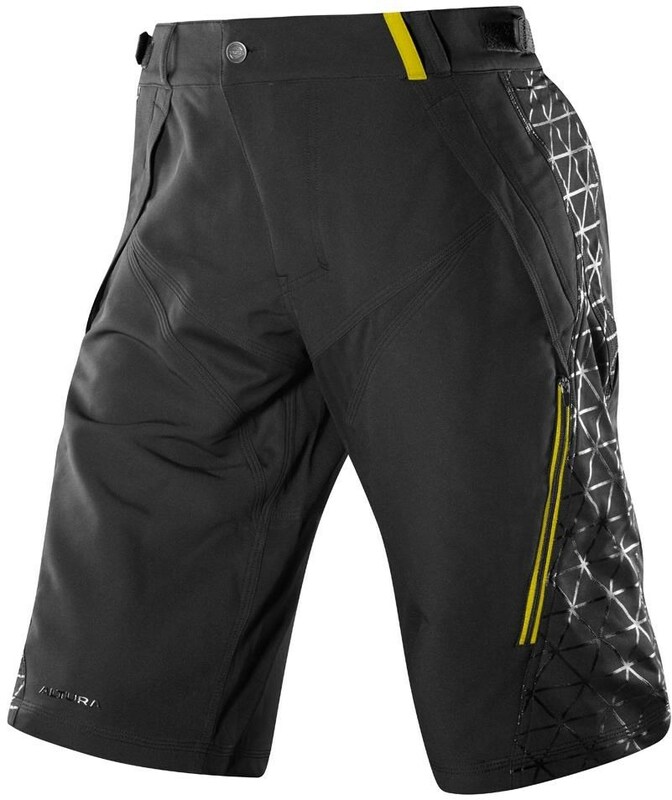 In our opinion, the Endura Hummvee baggy shorts are the best MTB shorts under £60. They have been for years. These shorts really mean business. They're tough, practical and loads of pockets. 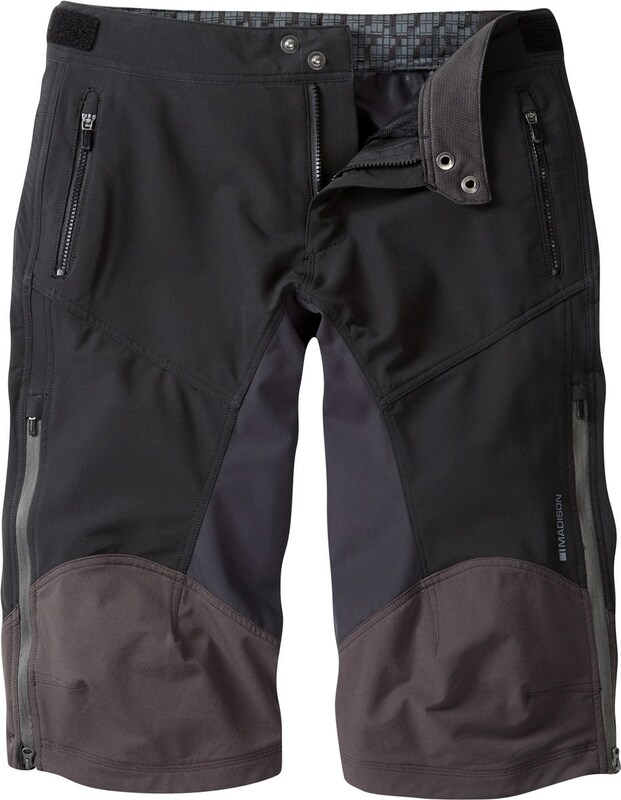 If you’re looking for a pair of baggies to use all year round, you won’t go far wrong with the Madison Zenith MTB short. You get a huge waterproof 2-layer rear panel to keep trail spray from soaking your behind. Extra DWR water resistant treatment on the front helps to shed spray as well. Water resistant hand pockets and phone pocket helps protect your essentials from the elements. Durable stretch fabric with Ripstop on the knee section can handle the most rugged rides. 2-way mesh back zippers run the length of the shorts let you fully control the temperature; ideal when you’re slogging up the climbs. Extra features like pop studs and a chunky fly zipper all add to the bombproof construction of these top-quality baggies. 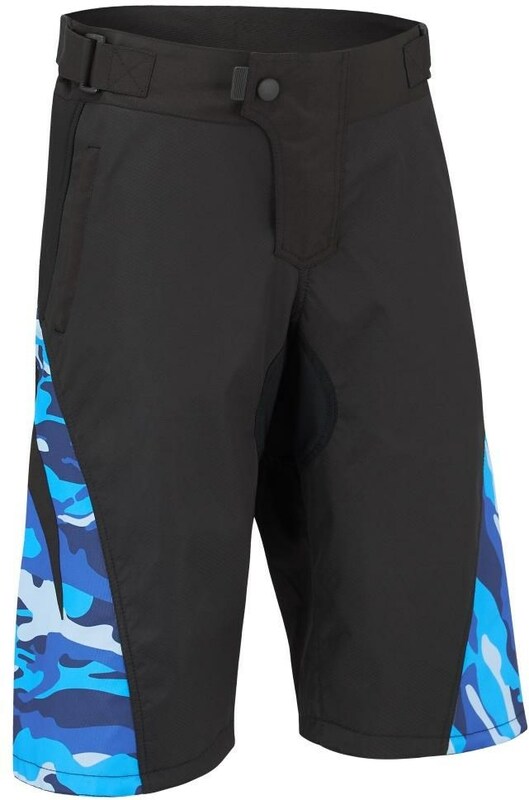 Great year-round MTB shorts with a waterproof rear panel. Topping out a pick of the best baggy shorts is the Altura Attack Three 60 baggies. At this price point, you expect a technical fabric and the Attack deliver. Built from Altura Shield technology they're are lightweight, offer wind and rain protection, while being very breathable. A durable Cordura seat panel is seam sealed at critical areas to stop water leaking through. ErgoFit 3D patterning offers a more comfortable riding position. Zippered leg vents improve ventilation on tough rides while an adjustable waistband lets you get the right fit. A very capable pair of MTB shorts for any ride. Super technical fabric for any off-road adventure.